A recent publication from AstraZeneca provides a really interesting overview of the approach that they took to optimise the solubility of a series of GPR119 agonists. The initial lead compound 2 was only poorly soluble but, by obtaining small molecule x-ray structures of this and subsequent compounds, the AZ team were able to identify H-bonding networks within the crystal lattice and to target molecular features with the potential to disrupt these and other intermolecular interactions, thus lowering the melting point and increasing aqueous solubility. The paper describes this process in some detail and also highlights other key strategies that were used to progress from compound 2 through to 42, a clinical candidate for treating type II diabetes. The paper also serves to illustrate and build upon the concepts described in the review that we blogged previously. The large contact surfaces between proteins (~1,500–3,000 Å2). The flat and relatively featureless nature of these surfaces as compared to the active-sites on more traditional targets. The lack of a natural small molecule ligand to use as a lead molecule. However, as the authors go on to discuss, it is often found that a small number of amino acid residues contribute disproportionately to the binding interaction between proteins. Targeting these so-called hot-spots represents an approach to tackling these targets. The review provides a nice analysis of six examples of the successful discovery of inhibitors of protein-protein interactions. Recently, scientists at the Universities of Newcastle and Oxford have published the optimisation of a series of isoindolinone inhibitors of the interaction between Murine Double Minute 2 (MDM2) and p53. The tumor suppressor protein p53 acts as a signalling node and is involved in the response of cells to a range of stresses. Inactivation of p53 is often involved in the development and subsequent progression of cancer. Inhibitors of the MDM2-p53 interaction have been proposed as anti cancer agents. The same team has previously reported isoindolinone 49 that has an IC50 for the MDM2-p53 interaction of 15.9 μM. This paper outlines the optimisation of this compound to generate 74a with an IC50 of 0.17 μM. Ideally the optimisation would have been supported by X-ray crystallography, however the team were unable to obtain co-crystals of the series bound to their target, the MDM2 protein. Instead a combination of NMR studies and docking were used to predict binding modes for the inhibitors. Through the preparation and testing of analogues of 49 it was established that increases in potency were achievable through the introduction of a para nitro substituent on the N-benzyl group and by steric restriction of the 3-carbon chain through introduction of a cyclopropyl group. Despite considerable efforts to find a suitable replacement for the nitro-group the team were unable to find a similarly active replacement. Separation and testing of the enantiomers of 74 showed that the (R) form, 74a, is primarily responsible for the MDM2-p53 inhibition. The authors go on to demonstrate cellular activity for 74a in a range of assays. This paper provides nice evidence of the inroads that medicinal chemists are making into the challenging protein-protein interaction target class. A recently published letter from scientists at Boehringer Ingelheim nicely summarizes recent advances in our understanding of G protein-coupled receptor (GPCR) structure and function. X-ray structures of the inactive forms of bovine rhodopsin (2000), β2 adrenergic receptor (2007 – with antibody and as a T4-lysozyme fusion), A2a adenosine receptor (2008), CXCR4 chemokine receptor (2010), and dopamine D3 receptor (2010) have all been published and despite low sequence homology all of these were shown to have transmembrane (TM) regions with high levels of 3D structural similarity. The main structural differences in proximity to the ligand binding sites were noted in extracellular loop regions and modeling these motifs (as well as the ligand binding mode) has proved to be challenging. With no reliable template available for homology modeling of the active states, the recent publication of the crystal structure of long acting agonist, BI-167107 (in yellow below), to β2 in what appears to be an activated form, is of particular note. Surprisingly, the ligand binding site in this structure is very similar to that modeled for a related agonist bound to an inactive form (in green below). Inactive structures of GPCRs are sufficiently good templates for activated state models (also see recent structures of β1 and β2 with agonists bound in the inactive state). The molecular switching between inactive and active receptor forms appears to be controlled by significant residue movements (and disruption of a hydrophobic network) one turn beyond the so-called “toggle switch” (W286 in β2). This information could enable better modeling of ligand-induced activation. The high similarity of binding sites in inactive and active receptors may make in silico discrimination between agonists and antagonists extremely difficult, if not impossible. However, they emphasize the importance of obtaining additional structural data for activated GPCR complexes in order to establish the generality of these early observations and to elucidate the best methods for incorporating these findings into computational approaches to predicting ligand activity. It’ll be interesting to see how this area develops as additional structures become available. An in vitro cell viability screen in THLE cells (+/- P450 transfection) (See a key reference describing a related screen from Pfizer). A HepG2 ‘Crabtree effect’ toxicity assay – to detect mitochondrial poisons (in galactose medium cultured cells – see presentation from AstraZeneca). Biliary transport inhibition via a membrane vesicle assay in insect cells overexpressing specific transporters. Quantification of inhibition of ATP-dependent biliary transport (e.g. inhibition of bile salt transporter [BSEP]) correlates with DILI – see Greer (2009)). The latest Nature Reviews|Drug Discovery contains an extensive review article which summarises much of this material as well as additional background information, in particular reviewing the pros & cons of reactive metabolite screening using GSH/CN trapping assays (and highlighting an interesting new hard & soft nucleophilic trapping agent containing both Cys & Lys residues). A number of decision trees and methodologies are reviewed, including data arising from Merck’s extensive use of early covalent binding studies (which require commitment to the preparation of radio-labelled drug substance and are generally viewed as definitive go/no go experiments) and which, with no correlation between the incidence of liver toxicity and the observed levels of covalent binding, actually questioned the whole approach. The review finishes somewhat philosophically by challenging a number of existing opinions/dogma and emphasises the need to continue informatics approaches to help to identify potentially harmful protein adducts (e.g. use of the Target Protein Database which is a repository for all publicly available information relating to known covalent adducts of mammalian proteins and chemically-reactive metabolites of xenobiotic agents, including drugs). Following on from his earlier papers (e.g. ADMET rules of thumb for candidate drug design), Gleeson’s most recent publication in Nature Reviews|Drug Discovery details a now familiar tale of physicochemical woe associated with the failure of many medicinal chemistry programmes to focus adequately on properties other than target affinity. Once again arguing that an over-reliance on targeting high potency in order to minimize the clinical dose and risk of toxicity related attrition (see now classic papers & citing works by Leeson and Hann) has continually seduced medicinal chemists away from ‘drug-like space’. These are points which in themselves are worthy of further emphasis, but of particular interest in this case is the origin of the data in the ChEMBL database, a publicly accessible database of targets and drugs compiled by the European Bioinformatics Institute (EBI). Whilst some of the available data are incomplete (and the authors acknowledge the limitations in their analyses) this database is an important and often under-utilized source of information and is worthy of wider attention. In contrast to many of the physicochemical analyses published to date, all the ChemBL source information is freely accessible for others to validate and/or challenge. The database contains over half a million compounds (stored as 2D structures), with accompanying in vitro biological data and calculated properties. For this analysis, the authors calculated an ADMET score (i.e. the deviation from oral drug space as defined by AlogP and molecular mass) to characterize the data set. The plot below shows 1791 oral drugs colour-coded according to their ADMET score (on the left), and then (on the right) the same drugs compared with the scores for the total content of the ChEMBL database (approximately 200k compounds). A greater deviation from oral drug space is observed in the latter case (14% of drugs have ADMET scores >2 compared with 39% of ChEMBL molecules). Average oral drug potency is approx 50 nM (Another clear observation was that 8% of oral drugs have both mol mass > 400 and AlogP > 4, compared to 30% of all ChEMBL molecules and 41% of ChEMBL molecules with nanomolar potency). There was no clear relationship between in vitro potency and therapeutic dose (which is perhaps unsurprising given the numerous additional factors involved). Whilst the points made in the paper mainly serve to reinforce the conclusions of earlier publications, they nonetheless highlight the importance, and usefulness, of open-source information sources and the prospect of their more widespread utility in future. Design strategies for optimizing unbound brain concentration in the CNS. Recent publications (e.g. Wager, et.al., Defining Desirable Central Nervous System Drug Space…; and the earlier Hitchcock, et.al., Structure−Brain Exposure Relationships) have highlighted the key physicochemical property space within which CNS drugs are located and to which drug discovery efforts ought to ostensibly be aligned in order to achieve the required balance of efficacy and safety. However, the authors stress that optimizing unbound brain and plasma concentration ratios (or brain availability) by adopting a more holistic, multi-parameter approach is crucial to success (and they refer back to another of their own recent publications in this vein). Structural elements associated with blood-brain barrier (BBB) penetration and computational approaches to predicting BBB permeability are also discussed briefly. Screening strategies to optimise brain availability. This section looks at the role of transporters (e.g. P-gp) in controlling molecular access to the CNS and at in-vitro and in-vivo screening approaches to addressing this issue in drug discovery. The recent publication of the mouse P-gp x-ray crystal structure (PDB3G60) and it’s implications are also discussed. Brain Delivery Approaches. Molecules with properties that fall outside the property space of known CNS drugs (e.g. antibodies, siRNA, peptides) offer novel approaches to the treatment of CNS disease and numerous innovative approaches to the delivery of such agents are under investigation. The final section summarizes progress in this area. An excellent J.Med.Chem. perspective titled ‘Synopsis of Some Recent Tactical Applications of Bioisosteres in Drug Design‘ has just published (The article is based on a short course presented at an ACS Prospectives conference in 2009). The author gives a brief introduction to the concept of biosisosterism (classical and non-classical) but concentrates on pulling together numerous recent examples which together illustrate the use of bioisosteres to address a diverse range of issues that are commonly encountered in the process of drug discovery. Whilst he expressly states the intention to avoid compiling a comprehensive catalogue of bioisosteres the paper does, nonetheless, cover a wide range of isosteres and it includes a lot of data and primary references that will serve as key resource material for medicinal chemists. A really nice paper and highly recommended reading material. Rapamycin and it’s analogues (or rapalogues e.g. CCI-779) modulate the phosphatidylinositol 3-kinase (PI3K) signalling cascade by binding to an allosteric site on the mTORC1 complex (Mammalian target of rapamycin (mTOR), a class IV PI3K protein kinase, forms two functional complexes, mTORC1 and mTORC2). mTOR plays a major role in regulating cell growth and proliferation and it’s aberrant function is implicated in a number of cancers. However, whilst rapalogues do demonstrate clinical benefits in cancer patients, it is now thought that inhibiting both mTORC1 and mTORC2 simultaneously will result in improved efficacy. Consequently, numerous groups have pursued mTOR active site inhibitors (common to both active complexes) and, in addition, the highly homologous active site of the Class 1 PI3Ks, which activate mTOR, has made dual PI3K/mTOR inhibitors still more attractive as potential cancer therapeutics (see a recent review for more information and details of compounds currently undergoing clinical evaluation). A recent paper from Pfizer describes some of their work in this area. Following high-throughput screening, an early lead (2) with good pI3Kα potency and high ligand efficiency (0.48) was identified. Compound 2 had moderate activity at mTOR but otherwise was selective across a panel of other protein kinases. An x-ray co-crystal structure (PDB3ML8) of 2 bound into the active site of PI3Kγ was used to guide subsequent optimisation efforts (key binding motifs are highlighted below). Compound 2 had poor pharmacokinetics (high in vitro clearance) and the group’s design strategy focused on replacing any metabolic hot spots whilst maintaining drug-like physical properties and, at the same time, improving the mTOR activity. The benzyl alcohol was the first group identified as conferring a metabolic liability and N-dealkylation of the N-methylaminopyrimidine was also anticipated to be a likely metabolic pathway. Isosteric replacements for the benzyl alcohol were introduced and the desmethyl aminopyrimidine analogues were prepared whilst ensuring that logP and MW were not increased significantly. 2-Methoxypyridines were identified as the preferred benzyl alcohol replacements and, in combination with the desmethyl amino modification, were found to lower clearance and improve mTOR potency (the N-Me substituent was postulated to make an unfavourable interaction with the mTOR protein). The cyclopentyl group in 2 was then modified to optimise potency and improve solubility through the addition of polar substituents. 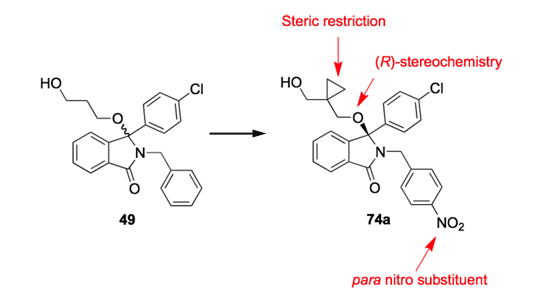 Hydroxyethyl-substituted cyclohexanol in this position gave the optimal balance of properties and led to the identification of their clinical candidate, PF-04691502 (Ki=0.57 and 16 nM at PI3Kα and mTOR respectively), which was subsequently advanced into a phase I clinical trial. The progression from 2 to PF-04691502 nicely illustrates the use of structure-based design to optimise multiple physicochemical properties and the authors illustrate this succinctly (see below) using a plot of the mPI3Kα potency vs cLogP overlaid with contours of equivalent lipophilic efficiency (LipE). In moving from compound 2 to the eventual candidate 1 (PF-04691502) the LipE was increased from under 6 to about 8. The x-ray co-crystal structure (PDB3ML9) of PF-04691502 revealed a number of interesting features (see above), including a water-mediated H-bond and an internal H-bond. Sulfonyl pyridines have utility both as constituents of bioactive molecules and as synthetic intermediates. Typical methods for their preparation have suffered from the use of odiferous thiols, capricious oxidation steps, poor atom economy, and production of significant amounts of hazardous waste. Scientists in process research at Merck recently published a nice, straightforward, and one-pot approach which addresses all of these issues. Their method involves direct displacement of chloropyridines (they do also demonstrate that the methodology applies equally to other halides and triflates) with sulfinic acid salts in the presence of tetrabutylammonium chloride (TBACl). [The TBACl is postulated to enhance the solubility of the sulfinic acid salt in the solvent used (Dimethylacetamide, DMAc)]. The method works equally well for electron-deficient, electron-neutral, and electron-rich chloropyridines and is operationally straightforward (See examples above – an equivalent of HCl is required to protonate, and hence activate, the pyridine in the case of the latter two classes of substrate). The products are isolated in high yield simply by quenching with water and filtration of the resulting slurry. A recent letter in ACS Med.Chem.Lett. details the optimisation of a series of inhibitors of the Hepatitis C virus (HCV) NS3/4A protease, and is interesting in that it provides detailed pharmacokinetic data for a series of macrocyclic lactones, a class of therapeutic agents with physicochemical properties that fall outside the typical range with which most medicinal chemists are familiar. The current front line therapy for HCV infection (which can lead to liver cirrhosis) involves treatment with PEGylated interferon α (PEGasys or PEG-Intron, by injection) and ribavirin (orally). Unfortunately this approach has limited efficacy due, in part, to the low completion rates observed for the lengthy (~1 year) course of therapy. The clear need for improved therapies and the associated commercial opportunity has led to many companies progressing molecules into the clinic (see this overview of the area), a number of which have targeted NS3/4A protease. The NS3/4A protease represents an attractive target as it is essential for viral polyprotein maturation. Boehringer Ingelheim (BI) initially led the field in this area and achieved proof of concept with BILN-2061, although this molecule was subsequently terminated due to cardiac toxicity in pre-clinical species. More recently, both Vertex (Telaprevir, VX-950) and Schering-Plough (Boceprevir, SCH 503034) have advanced molecules to Phase III, with several other companies close behind. A previous report from Merck had described their entry into this field using a molecular modelling approach to design analogues of BILN-2061. Interestingly, this approach led to the surprisingly straightforward switch from a P1-P3 tether (highlighted above) to a P2-P4 tether (see below) and subsequently to the identification of a clinical candidate, MK-7009, following painstaking optimisation of the P2 and P3 substituents. This highly potent candidate intriguingly contains 2 carbamate groups within its macrocyle. Good plasma exposures were observed in dogs and chimpanzees and whilst high liver exposures (which is clearly key for the target indication) were obtained in rats and rhesus monkeys, disappointingly low plasma exposures (which are required to access the non-hepatic HCV replication sites) were observed in these species. In an effort to address these potential shortcomings, the letter describes the optimisation of the isoquinoline template, originally reported in the J.Am.Chem.Soc. paper referenced above, rather than the isoindoline carbamate present in the first clinical candidate (MK-7009). The authors describe how they sought to improve the potency and rat plasma/liver concentrations, relative to their previous lead molecule, mainly by changes to the P3 group and to the isoquinoline substituents. Unfortunately, and the authors are to be admired for their refreshing honesty in this respect, the PK of this series was unpredictable and there was no alternative but to screen a large number of compounds to identify those which combined the highest rat oral plasma and liver exposures with the requisite potency. A seemingly clear link was observed between increased lipophilicity at P3 and both an increase in plasma concentrations and a reduction in potency in the serum protein-containing assay system that was used. However, this understandable link to lipophilicity did not hold for all changes or indeed for all of the isoquinoline substituents that were explored. In the end, it appears that the clinical candidate, MK-1220, was chosen following the detailed characterisation of a relatively large set of similar analogues. Nonetheless, these data do provide the opportunity to reflect on the fact that some of these macrocyclic templates are able to achieve good levels of cell permeability and display favourable pharmacokinetic profiles whilst clearly lying in an increasingly taboo physicochemical and molecular weight territory (a recent paper from Ensemble Therapeutics Corp. gives some further insight into this area of drug discovery in which the rule of five is clearly violated).